You’re definitely ahead of me. I had never heard of a TARDIS or Doctor Who. I have to admit that I have never heard of a TARDIS or Doctor Who. I’m also interested to learn more. If I’d had time and had been wearing boots, I would have tromped through the snow for a closer look at the TARDIS. It may have been locked, though. Over the years, I have avoided “Dr. Who”…….not really my ‘thing’ so will be curious for the reasoning/answer, also! My TV viewing is limited to whatever reception we get via our rooftop antenna. Therefore I am unfamiliar with a lot of shows. Sci-fi has never interested me. PBS has a lot of British/mystery shows on and DH finds it extremely difficult to cut through a British accent, to say nothing of the “humor” not at all being his ‘thing’. SciFi isn’t on his radar, either, although I do enjoy a good mystery! Anyhow, that’s why we have not even ventured any exploration of such programming. My son is very much into sci-fi and fantasy. He at least told me what that blue box was and then promptly told me to “google” Doctor Who and TARDIS. I should share this with my daughter, a Dr. Who fan who would recognize this right away. I learned what a tardis was last year from her and her boyfriend and my daughter-in-law – all Dr. Who fans. Maybe the person who put it in their yard wants to offer anyone who needs it a way out! Or a way in…..there are possibilities here. I am on my way over to Kenyon right now, to escape winter. Ha. Yes, show this to your daughter. I’d love to hear her ideas. My son is a big Dr. Who fan and has a fleece jacket with the Tardis on it. He gets comments in public every time he wears it. He, then, would understand why someone would place a TARDIS in their front yard? Yes, he would! I’ll ask him. I will await your son’s response then. I have never watched Dr. Who, but I’m familiar with the show to a small degree. I love that the TARDIS (which my small degree of familiary did NOT include!) showed up in MN…even better, in a small town! I love stuff like that – it connects our huge world, making it smaller and more livable! This is exactly what I thought, too, Gretchen. We are all more connected than we realize. I wonder what the Kenyonites think of the TARDIS. Small-town residents can be quite opinionated. I can almost hear the chatter at the local cafe. 🙂 Yes, me too. It is a small world, afterall, and it’s good to be reminded of that from time to time. I do love the whimsy of the person who put that up. A return trip to Kenyon may be in order to get some answers. Let me know if Gavin offers any insights. I never understood the appeal of Doctor Who, I’m afraid. But the blue makes a nice pop of color in a winter landscape. There you go and I totally agree. I wonder if, like the “real” Tardis, it is bigger on the inside than it appears or if it’s just a big blue box. Your lack of time to explore allows the imagination to fill it. Good to hear from you, Kristin. Clearly you know way more about the TARDIS than me. My son is a computer engineering student and most definitely a geek. I’m not surprised he likes the show and could tell me about it. He reads a lot of sci-fi and fantasy, genres I never read. I see you found my T.A.R.D.I.S. I am from England originally and grew up on Doctor Who, so I am a big fan. 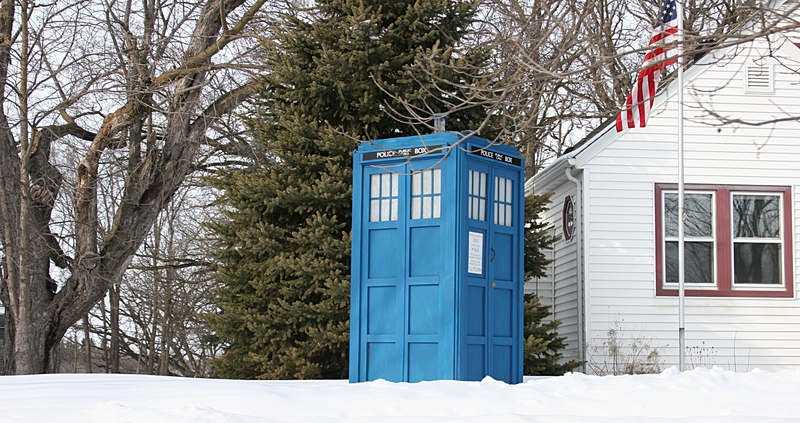 People have traveled from all over Minnesota and Iowa to see it, and it’s fun to Google ” TARDIS in Kenyon MN ” to see where it may pop up next. It looks even better at night, I have a solar powered LED spotlight inside which lights up all the windows, and the lantern on the roof is also solar powered. To answer the question about the door, yes it is locked… but I do have the key. So great to hear from you. After I published the post, I found the story in the Kenyon paper. What a fun project for you, especially getting all that attention and interest. Should I happen to be in Kenyon with time to spare, I will stop by and ask you to unlock your TARDIS. Thanks for stopping by with this additional info. I’ll consider that an invitation. Can you give the address where it is located, I would love to have my son take his picture by it, he is a huge fan, he went to London recently with a school trip and the tar dis was too far, he was disappointed. I would love to surprise him and go on a road trip to see it. 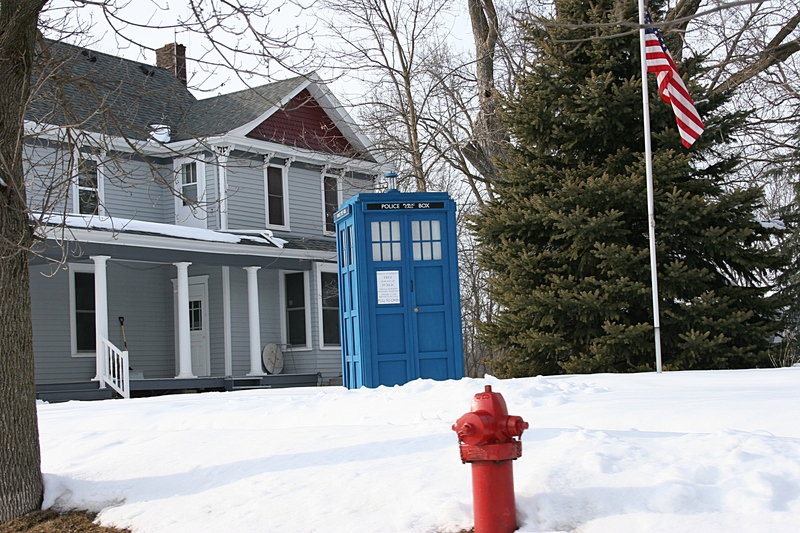 Dawn, the TARDIS is located at 102 Gunderson Boulevard (Minnesota Highway 60) on the west residential edge of Kenyon. If you check the other comments on this post, you will see one from the guy who built it. Can we take a picture by it if we stop? Absolutely. If you can reach the owner, he will even unlock the TARDIS for you. I have no idea when he’s around. Thanks so much! I cannot wait to stop by. I love your blog. Discovering new places to visit. Thank you, Dawn. I love hearing this from readers like you, that I am showing you new places to check out. I would love to have a TARDIS in my yard. Or living room. I hope you have a big living room. Love your blog and beautiful pics. I was just through Kenyon a few weeks ago and, yes, the TARDIS was still there. Thanks! Have you ever went through Elysian? There is a cute alpaca farm, that looked like it would be good pics. I love the look of the alpacas, they are such cute funny animals. Again, love your blog. Yes, I pass through Elysian often. Are you talking about Okaman Elk Farm? No, but that looks super neat. We may have to go see that. This is right on hwy 60. It might be just a personal farm. I believe it is right before you hit town. It is just really cute. OK, that alpaca farm is not ringing a bell w/ me. This elk farm is on a county road just off Highway 60 east of Elysian.